Oh my, the freshness of both the chicken and the spinach, mixed together with the rest of the ingredients makes this recipe mouth watering from the get-go! Place olive oil in large skillet over medium temperature until oil is heated. Add chopped garlic cooking for 1 1/2 minutes. Add chicken. Cook approximately 5 minutes. Turn chicken and cook other side until chicken is done and juice runs clear. Once chicken is cooked through, remove from pan and place on separate plate. Place spinach in same skillet and cook 2 minutes until wilted. Place spinach in a separate bowl. In same skillet add vinegar and chicken broth. Stir with wooden spoon making sure to mix together well. Be sure to get all the drippings from pan mixed in also. Once mixed add tomatoes including the juice and simmer on low heat for 7 minutes. Remove skillet from heat. On single serving plates spread a layer of spinach. 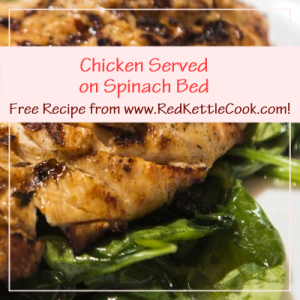 Place chicken in middle of spinach bed and cover with sauce.